I recently became aware of DC Central Kitchen’s “Healthier Corners” program while walking to my community’s corner store. One Sunday evening, I was responsible for making the dessert for Sunday dinner. My dessert of choice… banana pudding. I spice up my recipe by adding walnuts, vanilla wafers and banana slices. However, I forgot to add the actual bananas to my father’s list. I asked my mom for her car keys in order to drive to our “local grocery store”, when she told me, “Angel, you don’t need to waste gas on 3 bananas, walk down to the corner store and get them.” I burst into laughter, “Since when do WE have fresh fruits?” The corner store my mother was referring to was Jones’ Deli (technically it isn’t located on the corner… lol). Jones’ Deli has been apart of my community forever. As a child, I remember taking at least 3- 4 trips in a summer’s day for snow cones, juice, and chips. Even though the word ‘deli’, is apart of the stores name, the owners did not sell meat or your regular groceries… the only thing available was junk food, liquor and lottery tickets. Buying fresh fruits AND vegetables from the corner store was unheard of 5 years ago. Now, thanks to DC Central Kitchen, fresh fruits and vegetables are only a 5 min walk away from my home. In high school I completed the majority of my required community service hours at DC Central Kitchen ( http://www.dccentralkitchen.org/). DC Central Kitchen’s mission statement is simple: “[They] use food as a tool to strengthen our community.” They offer jobs, food prep training, and most importantly, they offer healthier choice to many communities that are located in Washington, DC’s food deserts. Before completing my community service there I thought that DC Central Kitchen was a soup kitchen for the homeless, I was unaware of the many opportunities that they offer to the residents of DC. 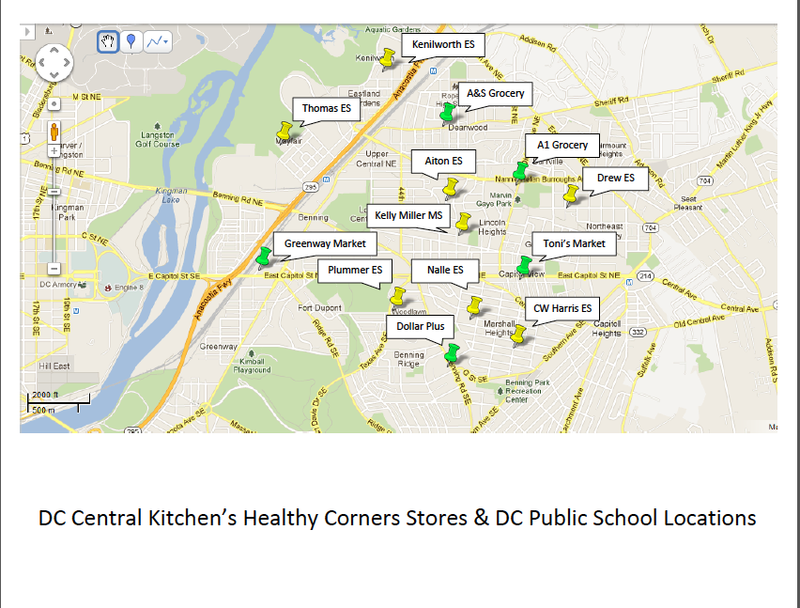 Outside of delivering healthier foods to corner stores, DC Central Kitchen works closely with DC Public Schools. During the school year, they employ kitchen staff at several public schools , and during the summer time DC Central Kitchen offers free meals (breakfast & lunch) to children living in the DC area. Two sites are located in my area: One summer feeding site is located directly across the street from my house, my elementary school, Plummer Elementary school, and the other site is located at Thomas ES. Although I attended Plummer ES for the majority of my elementary years, I am connected to Thomas ES through Arcadia, my younger sister attends this school, and my mother teaches at Thomas ES. DC Central Kitchen is saving DC from food deserts one meal at a time, and I appreciate their presence in my neighborhood. To learn more about DC Central Kitchen Healthy Corners Program click here. To learn more about DC Central Kitchen click here.